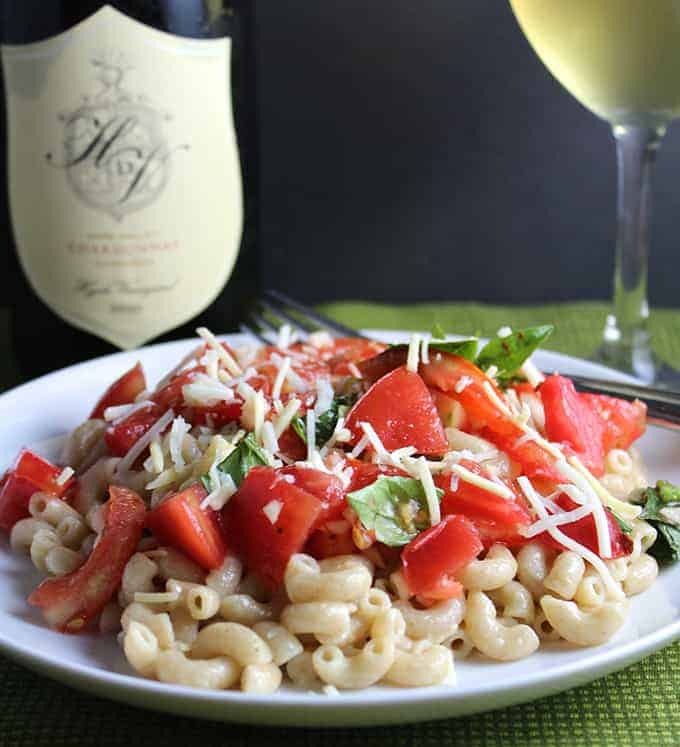 Comfort food meets summer flavors in this Mac and Cheddar with Tomato Basil Salsa recipe! Make this when local tomatoes and basil are good and ripe. You don’t have to wait til the chilly weather to enjoy mac & cheese! Here’s a perfect mac & cheese for the summertime. It’s a bit lighter, just enough cheddar to get some good cheesy flavor going. But the star of this dish–well, co-star at least–is some super fresh summer tomatoes. So grab some good cheddar and tomatoes, and treat yourself to this easy Mac and Cheddar with Tomato Basil Salsa! One of my favorite things to do with great summer tomatoes is to dice them up to use as a pasta topping. In late August, those diced tomatoes alone are a great topping. But here we step up our game a bit, and make a quick tomato basil salsa to top our mac and cheese. So easy, so much yum! Corn on the cob is the perfect side for this tasty mac and cheddar. How could you make this awesome summer meal even better? If you said wine, you guessed it right! I often gravitate toward crisp white wines when I’m not pour a red. 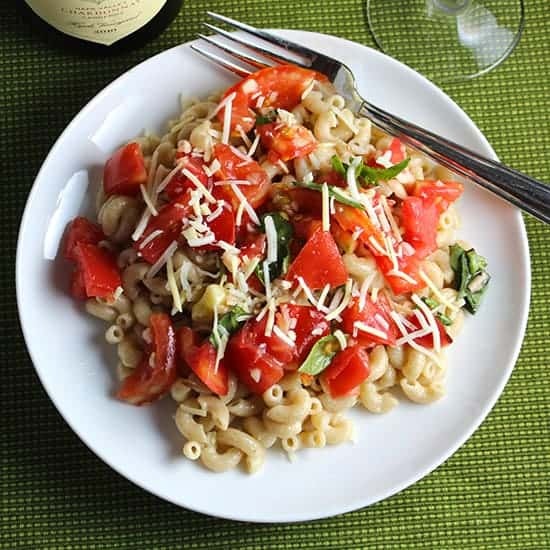 But I do like a good Chardonnay at times, and paired with this Mac and Cheddar with Tomato Basil Salsa is a great time to pour a chard. 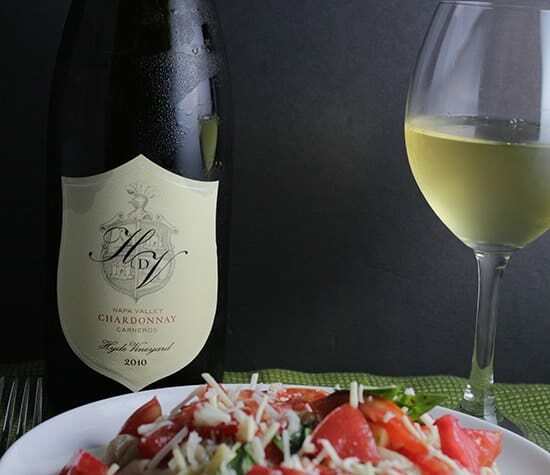 If you’ve got some buttery corn on the side, the pairing with a chard is even better! I had a special chard lying on our shelf for a bit. This was the perfect meal to break out the 2010 Hyde Vineyards Carneros Chardonnay from Napa. Lemon nose, taste of honey, hazelnut and stone. Great finish! Was a great pairing for the meal. This wine would typically go for about $80, but for somehow it was being offered for about half the price at Pairings. I was pretty pleased to take advantage of that deal! 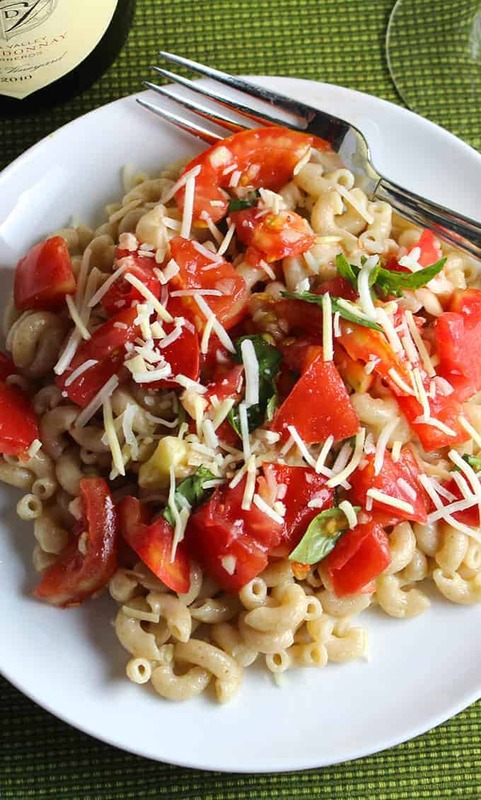 A simple mac and cheddar cheese topped with fresh tomato basil salsa, a great way to enjoy summer tomatoes. Start boiling water for pasta as you prep the other ingredients. In a medium bowl, combine the tomatoes, basil, 1 tablespoon olive oil, garlic, salt and red pepper flakes. Drain the pasta, then toss with one tablespoon of olive oil and the cheddar cheese. Plate a serving of the pasta, the top with the tomato basil salsa. Repeat for each serving and enjoy!